Blogger is a blog-publishing service that was acquired by Google in 2003. The blogs that are hosted on Blogger by Google are hosted on subdomains of blogspot.com. It is also possible to host a blog at Blogger.com and use your own custom domain to display the blog. This article provides information about using the Blogger service with your own custom domain name. This article concentrates on the second option of hosting a blog on your own custom domain. The first thing you must do (if you haven't done so already) is register a domain to point to the Blogger.com blog site. If you would like to register a new domain, visit the Registrations page. View the Domain Registration article for further details. If you already have a domain registered, proceed to the next section. Click the Add Hosting to a Domain / Sub-Domain button at the top of the page. If the domain is already hosted, just click the 'Edit' link to the right. On the next page, scroll down to the ‘DNS Only’ section near the bottom. Add the new domain, then click the Host DNS only! button. Log in to your Blogger account at http://www.blogger.com. 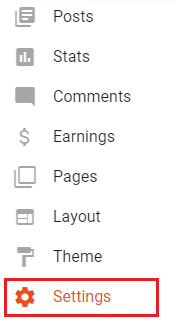 In the left pane, click the ‘Settings’ link. Click the link under your Blog Address titled ‘+ Setup a 3rd party URL for your blog’. An error displays with two DNS entries listed below. 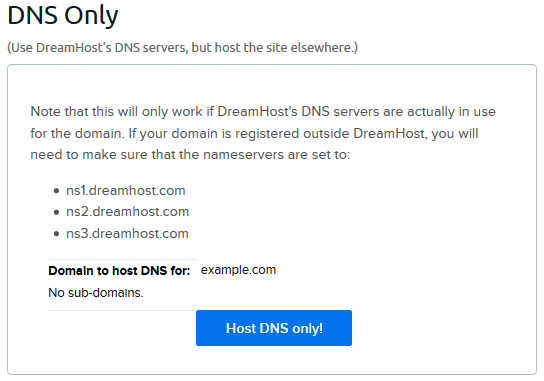 The two CNAME records that display below the error are CNAME records you must implement in the Custom DNS section of you DreamHost panel. Copy the CNAME entries, then navigate back to the Manage Domains page in your DreamHost panel. Click the ‘DNS’ link directly below your domain. View the CNAME Record article for details on how to input your two CNAME records. Once the custom Blogger CNAME records have been set, allow up to 6 hours for the new CNAME records to propagate before the new CNAME entries are recognized across the Internet. View the DNS propagation article for further details. 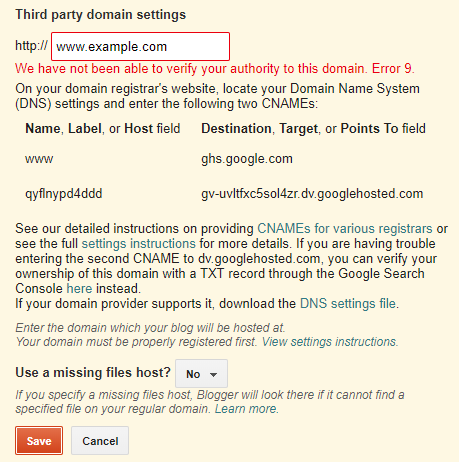 After the DNS has propagated, navigate back to the ‘Settings’ menu in your Blogger account. Once again, click the ‘+ Setup a 3rd party URL for your blog’ link. Enter your domain with the www in front, and then click the Save button. After you make these adjustments, it may take up to 24 hours for your blogspot.com address to redirect to your new custom domain.